In our drive to make more power, we often forget about adding measures to keep us safe at the greater speeds we are achieving. The CorkSport Big Brake Caliper Kit is a great place to start, however if you wish you could stop even faster say hello to the CorkSport 13inch Big Brake Kit. 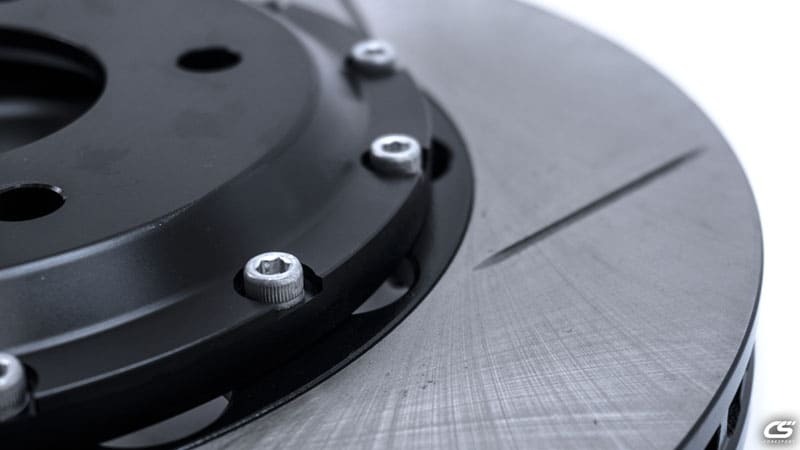 Designed for serious stopping power, it includes 13” directional rotors, powder-coated 4-piston calipers, upgraded pads, and everything you need to install it on your Mazdaspeed3. 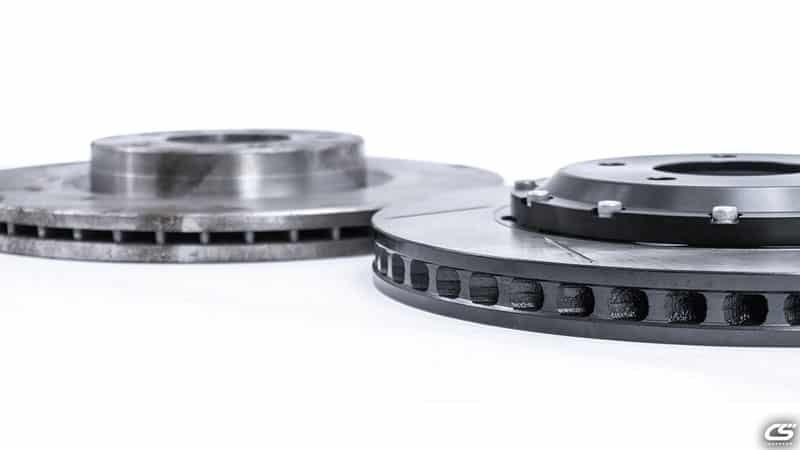 The rotors have been designed to provide optimum stopping power while minimizing noise for street use. The upgrade to 13inch diameter rotors provides greater braking torque for an equivalent braking force (like how a longer wrench makes it easier to loosen a tight bolt). The larger diameter combined with an increased thickness of 28mm (vs 25mm for OE) provides better cooling as there is a larger mass to reject heat into. In addition, slots were added to the friction surface to help sweep away any debris, brake dust, or gases that can otherwise affect your braking characteristics. We avoided drilling the rotors as holes decrease your total friction area and increase the chance that the rotor will crack. By moving to a two-piece design, we were able to decrease the overall weight of the rotor and by making the center section out of aluminum, it can help dissipate heat from the rest of the rotor better. Semi-Floating mounting between the inner and outer sections allows for quieter rotor vs having a full-floating center section. Finally, the vanes in the rotor are atypical; these vanes are the “fins” that connect the inside and outside of the rotor. By using curved vanes instead of the typical straight vanes, the rotor becomes directional and has to be used on a specific side of the vehicle; however, it also provides more efficient cooling. When the rotor turns, the curved vanes draw air through the center of the rotor and out through the edge, providing greater airflow than a straight vane and thus better cooling. There is another bonus to heat dissipation as the curved vanes have a larger surface area that will come in contact with air than an equivalent number of straight vanes. Forged aluminum, four-piston performance calipers are included with the kit in a choice of powder-coated blue, red, or black. 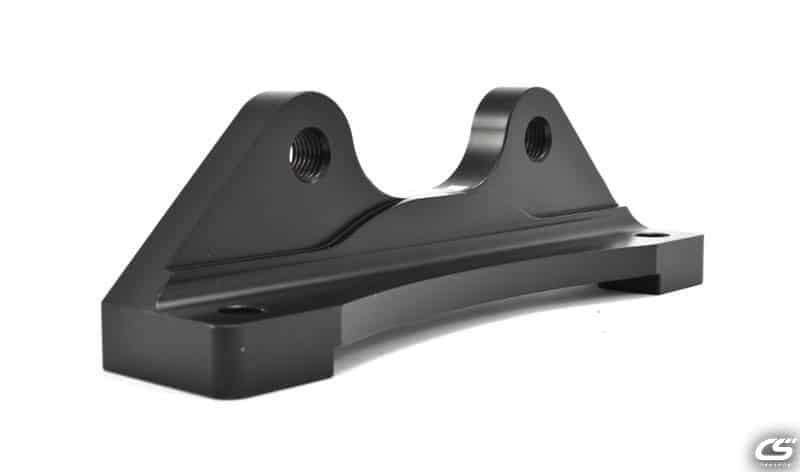 Although each piston is individually smaller in diameter than the single OE caliper piston, the total surface area is increased so the braking force at a specific brake pressure is increased. Larger piston surface area means larger brake pads can be used as well. You also get more even braking force on each side of the rotor due to the opposed piston design. This encourages even pad wear, even rotor wear, and consistent braking characteristics. The pistons themselves were specifically chosen for optimum braking endurance and reliability. They are staggered in size, with the pistons on the leading edge being slightly smaller than the trailing edge pistons. This is another protection for even pad wear. Each piston is made completely out of stainless steel for its low conductive heat transfer. What this means is that the pistons themselves will transfer less heat to the brake fluid than an aluminum or steel piston, decreasing the chances of overheated brake fluid. 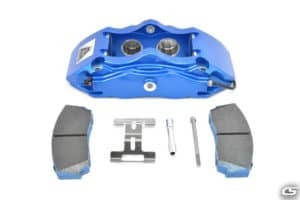 Street performance brake pads are included with the kit that bridges the gap between Mazdaspeed3 street and track pads. They are larger and a more aggressive compound than the pads included with the CorkSport MS3 Big Brake Caliper Kit but are not a full track pad. They will produce less dust and noise than a track pad but still need to be warmed up for optimum performance. Should you need new pads or want to change to a different pad, you have a bunch of options from G-Lock, Carbotech, EBC, Hawk, and various other manufacturers. The rest of the CorkSport 13inch BBK is composed of exactly what you need to properly and safely install the kit on your Mazdaspeed3. Stainless steel brake lines are included to remove any risk of a soft brake pedal and ensure the calipers are operating optimally. High strength steel brackets properly position the four-piston calipers on the new rotors using the OE bracket locations. All components are locked down using Grade 12.9 hardware with a corrosion resistant coating for lasting durability. The CorkSport Mazdaspeed 3 13” Big Brake Kit has everything you need to keep you safe at increased horsepower levels. If you’re looking for more than the stock brakes have to offer, let the CS Mazdaspeed3 BBK be a part of your build. Are you looking for bigger brakes? Is your Mazdaspeed3 in need of better stopping power? 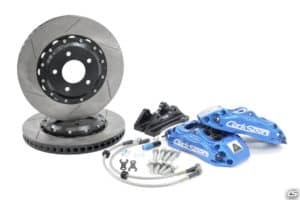 CorkSport now offers an even BIGGER Brake KIt! In our drive to make more power, we often forget about adding measures to keep us safe at the greater speeds we are achieving. The CorkSport Big Brake Caliper Kit is a great place to start, however, if you wish you could stop even faster say hello to the CorkSport 13inch Big Brake Kit. 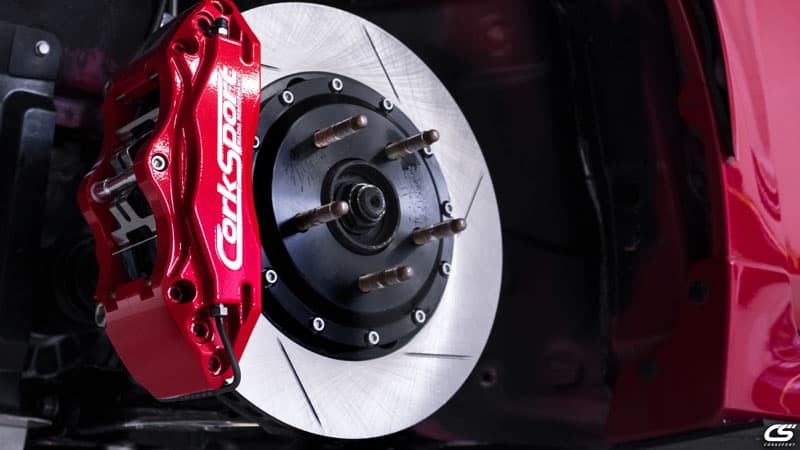 Designed for serious stopping power, it includes 13” directional rotors, powder-coated 4-piston calipers, upgraded pads, and everything you need to install it on your Mazdaspeed3.